This 12 page newspaper has one column headlines on the back page (pg. 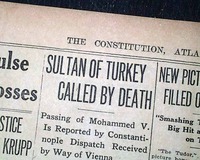 12): "SULTAN OF TURKEY CALLED BY DEATH", "Passing of Mohammed V. Is Reported by Constantinople Dispatch Received by War of Vienna". 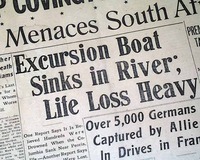 This 12 page newspaper has a three column headline on the front page: "Excursion Boat Sinks in River; Life Loss Heavy" with subhead (see images). 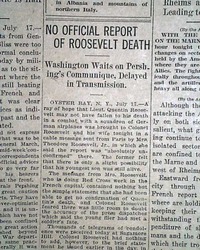 This tells of the sinking of the excursion steamer "Columbia" at Pekin, Illinois. 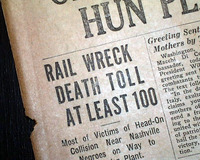 "RAIL WRECK DEATH TOLL AT LEAST 100" and "Most of Victims of Head-On Collision Near Nashville Negroes on Way yo Powder Plant" with smaller subheads.